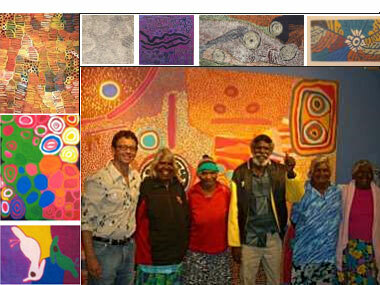 Minnie Pwerle, Maureen Nampijinpa Hudson, Murlaya Anderson, Brookes, Grant, Underwood, Bill Whiskey, Judy Napangari Martin, large Jila and Jilji Wangkatjung Community Artwork cut off the frame, Peggy Jones, Amnanari Brown. If anyone happens across them please notify the Fremantle police on 131 444 or for the Daisy Kemarre Moss work, Miranda Spain at the Werribee Police Station, 03 9742 9444. 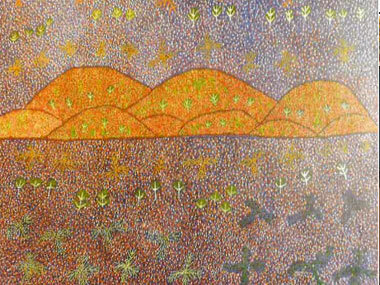 Missing work from Werribee Mansion Hotel & Spa by Daisy Kemarre Moss.